The composition and distribution of semi-labile dissolved organic matter across the southwest Pacific The composition and distribution of semi-labile dissolved organic matter Christos Panagiotopoulos et al. 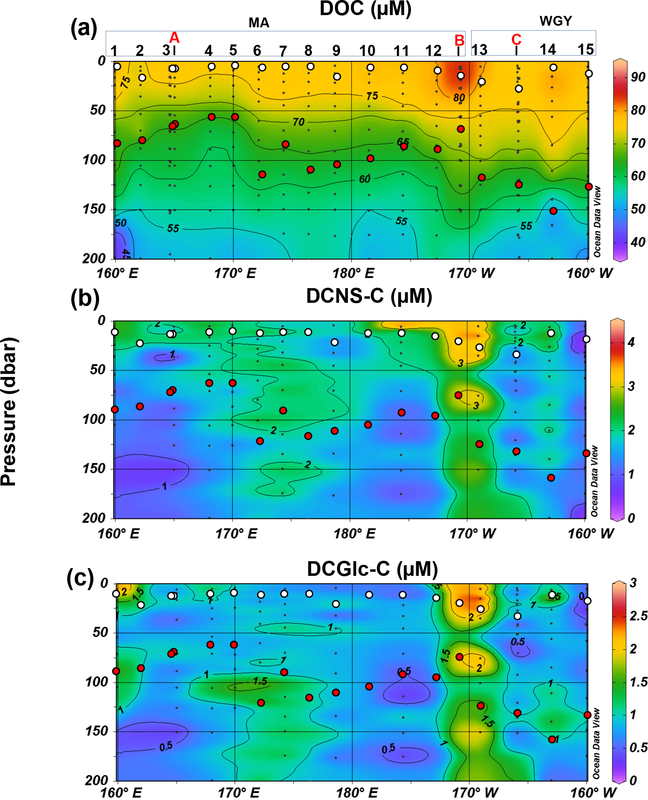 The distribution and dynamics of dissolved organic carbon (DOC) and dissolved combined neutral sugars (DCNS) were studied across an increasing oligotrophic gradient (18 to 22∘ S latitude) in the tropical South Pacific Ocean, spanning from the Melanesian Archipelago (MA) area to the western part of the South Pacific gyre (WGY), in austral summer as a part of the OUTPACE project. Our results show that DOC and DCNS concentrations exhibited no statistical differences between the MA and WGY areas (0–200 m: 47–81 µM C for DOC and 0.2-4.2 µM C for DCNS). However, due to a deepening of the euphotic zone, a deeper penetration of DOC was noticeable at 150 m of depth at the WGY area. Excess DOC (DOCEX) was determined as the difference between surface and deep-sea DOC values, and euphotic zone integrated stocks of both DOC and DOCEX were higher in the WGY than the MA area. Considering DOCEX as representative of semi-labile DOC (DOCSL), its residence time was calculated as the ratio of DOCSL to bacterial carbon demand (BCD). This residence time was 176±43 days (n=3) in the WGY area, about 3 times longer than in the MA area (Tr=51±13 days, n=8), suggesting an accumulation of semi-labile dissolved organic matter (DOM) in the surface waters of WGY. Average epipelagic (0–200 m) DCNS yields (DCNS × DOC−1) based on volumetric data were roughly similar in both areas, accounting for ∼2.8 % of DOC. DCNS exhibited a longer residence time in WGY (Tr=91±41 days, n=3) than in MA (Tr=31±10 days, n=8), further suggesting that this DCNS pool persists longer in the surface waters of the WGY. The accumulation of DOCEX in the surface waters of WGY is probably due to very slow bacterial degradation due to nutrient and/or energy limitation of heterotrophic prokaryotes, indicating that biologically produced DOC can be stored in the euphotic layer of the South Pacific gyre for a long period. Panagiotopoulos, C., Pujo-Pay, M., Benavides, M., Van Wambeke, F., and Sempéré, R.: The composition and distribution of semi-labile dissolved organic matter across the southwest Pacific, Biogeosciences, 16, 105-116, https://doi.org/10.5194/bg-16-105-2019, 2019. Gyres are oceanic deserts similar to those found in continental landscapes spanning an area of several thousands of kilometers and are characterized by low nutrient content and limited productivity (Raimbault et al., 2008; D'Hondt et al., 2009; Bender and Jonsson, 2016; de Verneil et al., 2017, 2018). Moreover, gyres are now considered as the world's plastic dumps (Law et al., 2010; Eriksen et al., 2013; Cozar et al., 2014), and their study may us help to understand future climate changes (Di Lorenzo et al., 2008; Zang et al., 2014) and marine ecosystem functioning (Sibert et al., 2016; Browing et al., 2017). Among the five well-known oceanic gyres, the South Pacific gyre, although the world's largest, has been less extensively studied mainly due to its remoteness from the main landmasses. Nonetheless, earlier studies indicated that the western tropical South Pacific (WTSP) is a hot spot of N2 fixation (Bonnet et al., 2013, 2017; Caffin et al., 2018) and recent studies have shown that there is a gradient of increasing oligotrophy from the WTSP to the western part of the Pacific gyre (Moutin et al., 2018). The ultra-oligotrophic regime is reached in the center of the gyre, and then it decreases within the eastern part of the gyre toward the Chilean coast (Claustre et al., 2008) with high residual phosphate concentrations in the center of the gyre (Moutin et al., 2008). Recent studies have indicated that efficient DOC export in the subtropical gyres is related to the inhibition of DOC utilization under low nutrient conditions (Letscher and Moore, 2015; Roshan and DeVries, 2017). Similar patterns have been observed for the oligotrophic Mediterranean Sea (Guyennon et al., 2015). However, little information exists regarding dissolved organic matter (DOM) dynamics in the South Pacific gyre, particularly for its semi-labile component (accumulation, export, fate), which is mainly represented by carbohydrates (Sempéré et al., 2008; Goldberg et al., 2011; Carlson and Hansell, 2015). Among the three well-identified chemical families (amino acids, lipids and carbohydrates) in seawater, carbohydrates are the major components of organic matter in surface and deep waters, accounting for 5 %–10 % and <5 % of dissolved organic carbon (DOC), respectively, as shown by liquid chromatography (Benner, 2002; Panagiotopoulos and Sempéré, 2005 and references therein). The carbohydrate pool of DOC consists of free monosaccharides, oligosaccharides and polysaccharides. Major polysaccharides are constituted by dissolved combined neutral sugars (DCNS), which are generally measured as their monosaccharide constituents (sum of fucose, rhamnose, arabinose, galactose, glucose, mannose and xylose) after acid hydrolysis (McCarthy et al., 1996; Aluwihare et al., 1997; Skoog and Benner, 1997; Kirchman et al., 2001; Panagiotopoulos and Sempéré, 2005). Other minor carbohydrate constituents of DOC include the amino sugars (glucosamine, galactosamine and muramic acid; Benner and Kaiser, 2003), uronic acids (glucuronic and galacturonic acids; Hung et al., 2003; Engel and Handel, 2011), methylated and dimethylated sugars (Panagiotopoulos et al., 2013), heptoses (Panagiotopoulos et al., 2013), and sugar alcohols (Van Pinxteren et al., 2012). Free monosaccharide concentrations range from 10 to 100 nM; they account for <10 % of total dissolved neutral sugars (TDNS), and experiments have shown that they are rapidly utilized (minutes to hours) by bacterioplankton; as such, they are considered as labile organic matter (Rich et al., 1996; Skoog et al., 1999; Kirchman et al., 2001). Polysaccharide or dissolved combined neutral sugars (DCNS) concentrations range from 200–800 nM; they account for 80 %–95 % of TDNS and experiments have shown that they disappear within timescales of days to months; as such, they are considered as labile and semi-labile organic matter (Aluwihare and Repeta, 1999; Carlson and Hansell, 2015, and references therein). Other studies have shown that this labile and/or semi-labile organic matter accumulates in the surface ocean and may potentially be exported to depth, contributing to the ocean carbon pump (Goldberg et al., 2010; Carlson and Hansell, 2015). In the frame of the OUTPACE project we studied DOM dynamics in terms of DOC and DCNS composition and tried to evaluate their residence time. The results are presented and discussed along with heterotrophic prokaryotic production in order to better understand the bacterial cycling of DOM in the region. Sampling took place along a 5500 km transect spanning from New Caledonia to French Polynesia in the WTSP aboard the R/V L'Atalante during the Oligotrophy from Ultra-oligoTrophy PACific Experiment (OUTPACE) cruise (19 February–5 April 2015; https://doi.org/10.17600/15000900). Samples were taken from 18 different stations comprising three long-duration stations (LDA, LDB and LDC; about 7–8 days) and 15 short-duration (SD1–15) stations (∼8 h). Biogeochemical and physical characteristics of these sites are described in detail elsewhere (Moutin et al., 2017). Briefly, the cruise took place between 18 and 20∘ S, covering two contrasting trophic regimes with increasing oligotrophy from west to east (Fig. 1). Discrete seawater samples were collected from 12 L Niskin bottles equipped with Viton O-rings and silicon tubes to avoid chemical contamination. For DOC and DCNS analyses, samples were filtered through two precombusted (450 ∘C for 24 h) GF/F filters using a custom-made, all-glass, Teflon filtration syringe system. Samples for DOC (SD: 1–15 including LD: A–C) were collected into precombusted glass ampoules (450 ∘C, 6 h) that were sealed after acidification with H3PO4 (85 %) and stored in the dark at 4 ∘C. Samples for DCNS (SD 1, 3–7, 9, 11, 13–15 including LD: C) were collected in 40 mL Falcon vials (previously cleaned with 10 % of HCl and Milli-Q water) and frozen at −20 ∘C until analysis. Figure 1Sampling stations during the OUTPACE cruise. The white line shows the vessel course (data from the hull-mounted ADCP positioning system). Stations and their respective names (SD1-SD15 including LDA, LDB and LDC) are depicted in grey. Figure courtesy of Thibault Wagener. DOC was measured by high-temperature combustion on a Shimadzu TOC-L analyzer (Cauwet, 1999). Typical analytical precision was ±0.1–0.5 µM C (SD) for multiple injections (three to four) of replicate samples. Consensus reference materials were injected every 12 to 17 samples to ensure stable operating conditions and were in the range 42–45 µM (https://hansell-lab.rsmas.miami.edu/consensus-reference-material/index.html, last access: 4 January 2019). Seawater samples were desalted using dialysis tubes with a molecular weight cutoff of 100–500 Da (Spectra/Por® Biotech cellulose ester) according to the protocol of Panagiotopoulos et al. (2014). Briefly, the dialysis tube was filled with 8 mL of the sample and the dialysis was conducted into a 1 L beaker filled with Milli-Q water at 4 ∘C in the dark. Dialysis was achieved after 4-5 h (salinity dropped from 35 to 1–2 g L−1). Samples were transferred into 40 mL plastic vials (Falcon; previously cleaned with 10 % HCl and Milli-Q water), frozen at −30 ∘C and freeze-dried. The obtained powder was hydrolyzed with 1 M HCl for 20 h at 100 ∘C and the samples were again freeze-dried to remove the HCl acid (Murrell and Hollibaugh, 2000; Engel and Handel, 2011). The dried samples were diluted in 4 mL of Milli-Q water, filtered through quartz wool and pipetted into scintillation vials for liquid chromatographic analysis. The vials were kept at 4 ∘C until the time of analysis (this never exceeded 24 h). The recovery yields of the whole procedure (dialysis and hydrolysis) were estimated using standard polysaccharides (laminarin and chondroitin sulfate) and ranged from 82 to 86 % (n=3). Finally, it is important to note that the current desalination procedure does not allow for the determination of the dissolved free neutral sugars (i.e., sugar monomers present in samples with MW ∼ 180 Da) because these compounds are lost and/or poorly recovered during the dialysis step (Panagiotopoulos et al., 2014). Carbohydrate concentrations in samples were measured by liquid chromatography according to Mopper et al. (1992) modified by Panagiotopoulos et al. (2001, 2014). Briefly, neutral monosaccharides were separated on an anion exchange column (Carbopac PA-1, Thermo) by isocratic elution (mobile phase 19 mM NaOH) and were detected by an electrochemical detector set in the pulsed amperometric mode (Panagiotopoulos et al., 2014). The flow rate and the column temperature were set at 0.7 mL min−1 and 17 ∘C, respectively. Data acquisition and processing were performed using the Dionex software Chromeleon. Repeated injections (n=6) of a dissolved sample resulted in a CV of 12 %–15 % for the peak area for all carbohydrates. Adonitol was used as an internal standard and was recovered at a percentage of 80 %–95 %; however, we have chosen not to correct our original data. Heterotrophic prokaryotic production (here abbreviated classically as “bacterial” production or BP) was determined onboard with the 3H-leucine incorporation technique to measure protein synthesis (Smith and Azam, 1992). Additional details are given in Van Wambeke et al. (2018). Briefly, 1.5 mL samples were incubated in the dark for 1–2 h after the addition of 3H-leucine at a final concentration of 20 nM, with the standard deviation of the triplicate measurements being on average 9 %. Isotopic dilution was checked and was close to 1 (Van Wambeke et al., 2018), and we therefore applied a conversion factor of 1.5 kg C mol leucine−1 to convert leucine incorporation to carbon equivalents (Kirchman, 1993). BP was corrected for leucine assimilation by Prochlorococcus (Duhamel et al., 2018) as described in Van Wambeke et al. (2018). To estimate bacterial carbon demand (BCD), which is used to calculate semi-labile DOC residence time, we used a bacterial growth efficiency (BGE) of 8 % as determined experimentally using dilution experiments during the OUTPACE cruise (Van Wambeke et al., 2018). 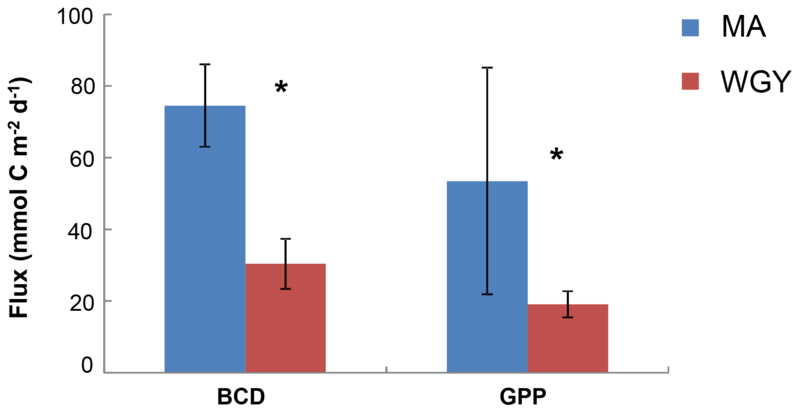 BCD was calculated by dividing BP values at each station by BGE. Euphotic zone integrals were then computed from volumetric rates. Figure 2Integrated stocks of bacterial carbon demand (BCD) and gross primary production (GPP) (mmol C m−2 day−1) over the euphotic zone. Data from Van Wambeke et al. (2018). Error bars correspond to standard deviation of the different stations. * BCD and GPP were statistically different between MA and WGY areas (Mann–Whitney test, p<0.05). The OUTPACE cruise was conducted under strong stratification conditions (Moutin et al., 2018) during the austral summer, encompassing a longitudinal gradient starting at the oligotrophic Melanesian Archipelago (MA waters; stations SD1-SD12 including LDA and LDB stations) and ending in the ultra-oligotrophic western part of the South Pacific gyre (WGY waters; stations SD13-SD15 including LDC station; Fig. 1). Additional information on the hydrological conditions of the study area (i.e., temperature, salinity) including water masses characteristics is provided elsewhere (de Verneil et al., 2018; Moutin et al., 2018). Mixed layer depth ranged from 11 to 34 m with higher values recorded in the WGY (Moutin et al., 2018). The depth of the deep chlorophyll maximum ranged from 69 to 119 m and from 122 to 155 m for the MA and WGY areas, respectively. Two different trends can be noticed in a first approach. Most of the biogeochemical parameters examined in the OUTPACE cruise (chlorophyll a concentrations, primary production, BP, BCD, N2 fixation rates and nutrient concentrations) showed significantly higher values in the MA area than in the WGY area (Moutin et al., 2018; Van Wambeke et al., 2018; Benavides et al., 2018; Caffin et al., 2018). These differences were also reflected by the distribution of the diazotrophic communities detected in both areas, further highlighting the different dynamics across the oligotrophic gradient (Stenegren et al., 2018; Moutin et al., 2017, 2018). The net heterotrophic–autotrophic status of the MA and WGY areas has been discussed in previous investigations by comparing BCD and gross primary production (GPP) (Fig. 2). By using propagation of errors, Van Wambeke et al. (2018) concluded that GPP minus BCD could not be considered different from zero at most of the stations investigated (11 out of 17) showing a metabolic balance. For the other stations, net heterotrophy was shown at stations SD 4–6 and LDB, with net autotrophy at station SD9 (Van Wambeke et al., 2018). The bulk of DOM as shown by DOC analysis did not follow the above biogeochemical pattern and showed little variability in DOC absolute concentrations, although a deeper penetration of DOM was noticeable at 150 m of depth in the WGY area (Fig. 3a; Table 1). As such, epipelagic (0–200 m) DOC concentrations throughout the OUTPACE cruise ranged from 47 to 81 µM C (mean ± sd: 67±10 µM; n=136) except at LDB (∼85 µM C), which is probably related to a decaying phytoplankton bloom (de Verneuil et al., 2018; Van Wambeke et al., 2018). Mesopelagic (200–1000 m) DOC values varied between 36 and 53 µM C (mean ± sd: 46±4 µM; n=67) (Fig. 4a; Table 1) and are in agreement with previous studies in the South Pacific Ocean (Doval and Hansell, 2000; Hansell et al., 2009; Raimbault et al., 2008). 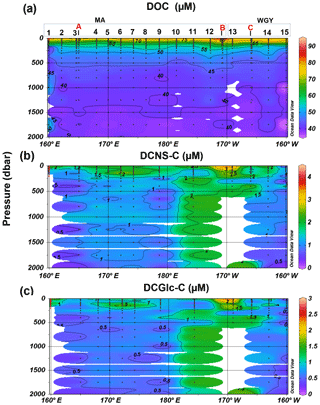 Figure 3Distribution of (a) dissolved organic carbon (DOC), (b) dissolved combined neutral sugars (DCNS) and (c) dissolved combined glucose (DCGlc) in the upper surface layer (0–200 m) of the study area. DCNS and DCGlc concentration is given in carbon equivalents in order to have the same unit as DOC. Long-duration stations (LDA, LDB and LDC) are also indicated in each graph. White and red circles indicate the mixed layer depth and deep chlorophyll maximum, respectively, for each station. Figure 4Depth profiles of (a) DOC, (b) DCNS and (c) DCGlc in the 0–2000 m layer of the study area. DCNS and DCGlc concentration is given in carbon equivalents in order to have the same unit as DOC. 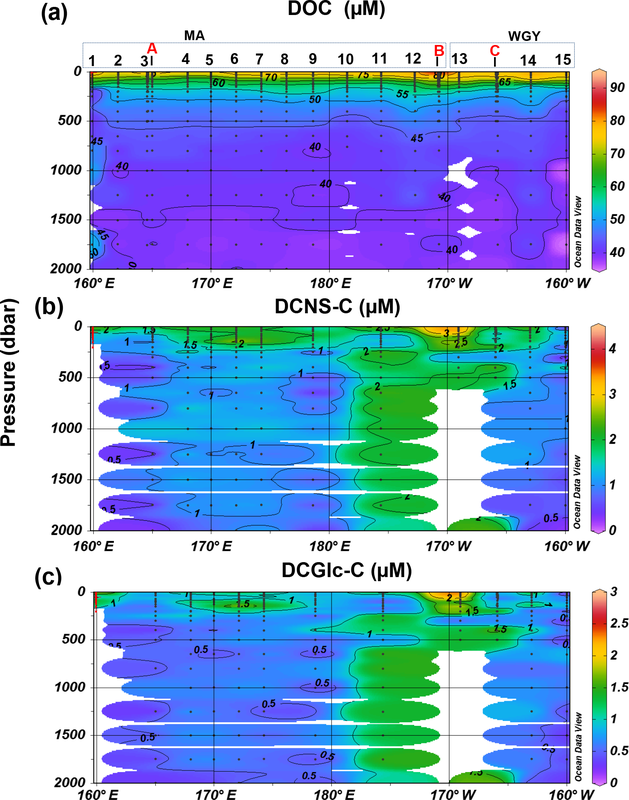 DCNS concentrations closely followed DOC trends and fluctuated between 0.2 and 4.2 µM C (mean ± sd: 1.9±0.8 µM; n=132) in the epipelagic zone (Fig. 3b; Table 1). These values are in good agreement with those previously reported for the central and/or the eastern part of the South Pacific gyre (1.1–3.0 µM C; Sempéré et al., 2008) that were recorded under strong stratification conditions during austral summer (Claustre et al., 2008). Compared with other oceanic provinces our epipelagic DCNS concentrations fall within the same range of those reported in the BATS station in the Sargasso Sea (1.0–2.7 µM C) also monitored under stratification conditions (Goldberg et al., 2010). 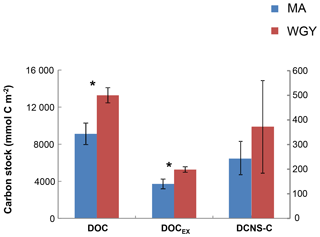 Mesopelagic DCNS concentrations ranged from 0.3 to 2.4 µM C (average ± sd: 1.2±0.6 µM; n=68) (Fig. 4b; Table 1) and concur with previously reported literature values at the ALOHA station (0.2–0.8 µM C; Kaiser and Benner, 2009) and in the equatorial Pacific (0.8–1 µM C; Skoog and Benner, 1997). The contribution of DCNS-C to the DOC pool is referred to here as DCNS yields and is presented as a percentage of DOC (i.e., DCNS-C × DOC−1 %). Epipelagic (0–200 m) average DCNS yields based on volumetric data were similar between the WGY (range 0.3–5.1 %; average ± sd: 2.8±1.3 %; n=41) and MA (range 0.8–7.0 %; average ± sd: 2.8±1.0 %; n=91) areas, whereas deeper than 200 m they were 2.4±1.0 % (n=23) and 2.7±1.3 % (n=43) for the WGY and MA, respectively (Table 1). These values are in good agreement with those reported for the eastern part of the gyre (Sempéré et al., 2008) and concur well with the range of values (2 %–7 %) recorded in the equatorial Pacific (Rich et al., 1996; Skoog and Benner, 1997). The molecular composition of carbohydrates revealed that glucose was the major monosaccharide at all depths in both the MA and WGY areas, accounting on average for 53±18 % (n=132) of the DCNS in epipelagic waters and 64±21 % (n=68) in mesopelagic waters (Table 1). 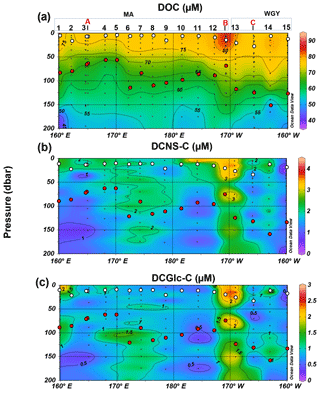 Epipelagic glucose concentrations (DCGlc-C) averaged 1.0±0.6 µM for n=132 in both areas (Fig. 3c, Table 1); however, at given depths, a higher mol % contribution of glucose was recorded in the WGY than the MA, especially at depths > 200 m (Fig. 5). Glucose was followed by xylose (9 %–12 %), galactose (4 %–9 %) and mannose (5 %–8 %), whereas the other monosaccharides accounted for <6 % of DCNS (Fig. 5). The same suite of monosaccharides was also reported by Sempéré et al. (2008), although the latter authors also found that arabinose was among the major monosaccharides. Finally, it is worth noting that the relative abundance of glucose increased with depth and sometimes accounted for 100 % of DCNS (Table 1, Fig. 5). Figure 5Average mole percentage (mol %) of dissolved monosaccharides at (a) the surface, (b) 200 m and (c) 2000 m of depth for MA and WGY areas. Monosaccharide abbreviations are as follows. Fuc. : fucose; Rha. : rhamnose; Ara. : arabinose; GlcN. : glucosamine; Gal. : galactose; Glc. : glucose; Man. : mannose and Xyl. : xylose. DOC stocks (euphotic zone integrated) were calculated at the same stations where carbohydrate (DCNS) data were available and were compared between the MA (stations: SD 1, 3, 4, 5, 6, 7, 9, 11) and WGY (SD13-SD15; LDC) stations (Fig. 6). DOC stock values in the euphotic were 9111±1159 (n=8) and 13 266±821 mmol C m−2 (n=4) for the MA and WGY areas, respectively. Excess DOC stock (DOCEX) was calculated by subtracting an average deep DOC value from the bulk surface DOC pool. This DOC value was 40 µM C and was estimated by averaging all DOC values below 1000 m of depth from all stations (39.6±1.4 µM C, n=36). DOCEX stock values averaged 3717±528 (n=8) and 5265±301 mmol C m−2 (n=4), accounting for about 40 % of DOC in both areas. DCNS-C represented 6.7 % and 7.1 % of DOCEX in the MA and WGY sites, respectively, further suggesting that only a small percentage of DOCEX can be attributed to DCNS (polysaccharides). Euphotic zone integrated stocks of DOC, DOCEX and DCNS were respectively 46 %, 42 % and 52 % higher in the WGY than in the MA (Fig. 6), as opposed to BCD and GPP (Fig. 2). This is a consequence of the deepening of the euphotic zone because the variability of the volumetric stocks was high and not statistically different in the euphotic zone between the MA and WGY areas. As indicated above DOCEX is calculated as the difference between the bulk surface DOC and deep DOC, with the latter assumed to be refractory. Thus, DOCEX is often described as “semi-labile” DOC or DOCSL with a turnover on timescales of weeks to months (Carlson and Hansell, 2015). DCNS belong to this semi-labile category of DOC (Biersmith and Benner, 1998; Aluwihare and Repeta, 1999; Benner, 2002), and the results of this study show that DCNS represented a low proportion (∼7 %) of DOCEX. Because the conditions of the HPLC technique employed in this study do not allow for the identification and quantification of all the carbohydrate components of DOC (methylated sugars, uronic acids, amino sugars, etc.) it is possible that the contribution of polysaccharides to DOCEX is underestimated. Previous investigations into amino sugars and methylated sugars indicated that these monosaccharides account for <3 % of the carbohydrate pool (Benner and Kaiser; Panagiotopoulos et al., 2013), while uronic acids may account for as much as 40 % of the carbohydrate pool (Engel et al., 2012), indicating that the latter compounds should at least be considered in future DOM lability studies. 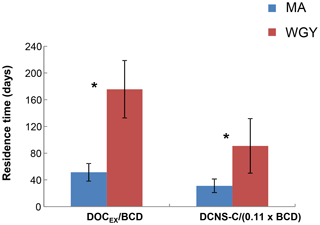 Figure 6Integrated carbon stocks (mmol C m−2) over the euphotic zone carbon in terms of DOC, DOCEX and DCNS-C (secondary axis). * DOC and DOCSL were statistically different between MA and WGY areas (Mann–Whitney test, p<0.05). Other semi-labile compounds that potentially may contribute to the DOCEX pool are proteins and lipids. Unfortunately, proteins (combined amino acids) were not measured in this study. Nonetheless, previous investigations indicated that total dissolved amino acids represent 0.7 %–1.1 % of DOC in the upper mesopelagic zone of the North Pacific (Kaiser and Benner, 2012), further suggesting a relatively small contribution of amino acids to DOCEX. During the OUTPACE cruise, assimilation rates of 3H-leucine using concentration kinetics were determined (Duhamel et al., 2018) and, based on the Wright and Hobbie (1966) protocol, the ambient concentration of leucine was determined. The results showed a lower ambient leucine concentration at the LDC (0.56 nM) than at the LDA (1.80 nM) stations (Duhamel et al., 2018). This result may suggest that single amino acid and perhaps protein concentrations are very low at the LDC station, reflecting the ultra-oligotrophic regime of the WGY. On the other hand, DOM exhibited only slightly different C ∕ N ratios between MA (C ∕ N = 13) and WGY (C ∕ N = 14), which does not suggest differences in DON dynamics in relation to organic matter lability (data from integrated values of 0–70 m; Moutin et al., 2018). Clearly, further investigations are warranted into combined and free amino acid distribution in relation to N2 fixation. Figure 7Residence time (days) of semi-labile DOC (Tr SL) and DCNS-C (Tr DCNS-C) for MA and WGY areas. * Tr SL and Tr DCNS-C were statistically different between MA and WGY areas (Mann–Whitney test, p<0.05). The high stock of DOCEX measured in the WGY was also characterized by an elevated residence time (Tr SL) calculated as the ratio of DOCEX ∕ BCD. This calculation is based on two assumptions. First, DOCEX is representative of DOCSL and the latter pool turnover is at the scale of seasonal mixing (i.e., weeks to months). Second, the BP used for BCD determination not only tracks the ultra-labile to labile organic matter consumption but also the DOCSL utilization. However, the leucine technique used for BP is based on incubations lasting 1–2 h and thus it tracks only labile DOC. Thus, the denominator of the above ratio is most likely biased; therefore, the Tr SL should be considered with caution due to a possible overestimation. On the other hand, could this ratio DOCEX ∕ BCD be representative of the labile DOC residence time? Three biodegradation experiments performed during the OUTPACE cruise showed that the labile DOC represented only 2.5 % to 5 % of the DOC pool (Van Wambeke et al., 2018), confirming that the residence time calculated from DOCEX ∕ BCD also overestimates the residence time of labile DOC. Overall, the bacterial production and BGEs associated with the use of semi-labile DOC are currently not technically measurable due to long-term confinement artifacts. Keeping in mind these limitations, we can assume that Tr SL is at least relatively comparable between MA and WGY. The high stock of DOCEX measured in WGY was characterized by an elevated Tr SL compared to MA. The results showed that Tr SL in the WGY was of the order of 176±43 days (n=3), i.e., about 3 times higher than in the MA region (TrSL=51±13 days, n=8), indicating an accumulation of the semi-labile DOM in the surface waters of WGY (Fig. 7). As suggested by previous studies the accumulation of DOC in the surface waters of oligotrophic regimes may be related to biotic and/or abiotic factors. Table 1Range and mean values (0–200 and 200–1000 m) of DOC, DCNS-C, DCGlc-C, DCNS-C ∕ DOC and DCGlc-C ∕ DCNS-C recorded during the OUTPACE cruise. MA comprises the SD2–SD12 stations and WGY comprises the LDC and SD13–SD15. Means of MA and WGY were not statistically different for any of the parameters presented (Mann–Whitney test, p>0.05). Full DOC and DCNS data along with other parameters measured during the OUTPACE cruise are available at http://www.obs-vlfr.fr/proof/ftpfree/outpace/db (last access: 4 January 2019). Nutrient limitation can prevent DOC assimilation by heterotrophic bacteria and, as such, sources and sinks are uncoupled, allowing for accumulation (Thingstad et al., 1997; Jiao et al., 2010; Shen et al., 2016). Biodegradation experiments (Van Wambeke et al., 2018) focusing on the determination of the BGE and the degradation of the labile DOC pool (turning over 10 days) revealed a less biodegradable DOM fraction and lower degradation rates at the LDC (2.4 % labile DOC; 0.012 day−1) than the LDA site (5.3 % labile DOC; 0.039 day−1). Other experiments, focusing on the factors limiting BP by testing the effect of different nutrient additions, showed that over a short time period, BP is initially limited by the availability of labile carbon in the WGY (as tracked with glucose addition; Van Wambeke et al., 2018). This limitation on BP by labile carbon and/or energy was also the case at the center of the South Pacific gyre (Van Wambeke et al., 2008), while nitrogen limitation (as tracked by addition of ammonium + nitrate) was more pronounced in the MA area. Although extensive photodegradation may transform recalcitrant organic matter into labile matter, the low content in chromophoric DOM recorded in the surface waters of WGY (αCDOM(350)=0.010–0.015 m−1, 0–50 m; Dupouy et al., unpublished results from the OUTPACE cruise) points toward already photobleached and thus photodegraded organic material (Tedetti et al., 2007; Carlson and Hansell, 2015). Notably, the 10 % irradiance depths for solar radiation (Z 10 %) clearly showed a higher penetration of UV radiation and PAR in the WGY area than in the MA area (Dupouy et al., 2018). These results are in agreement with previous investigations reporting intense solar radiation in the South Pacific gyre, highlighting a strong decrease in chromophoric dissolved organic matter (CDOM) in the gyre (Tedetti et al., 2007). Less energy available for heterotrophic prokaryotes should prevent them from degrading such recalcitrant, photodegraded organic matter. The computation of the carbon, nitrogen and phosphorus budgets in the upper 0–70 m layer by Moutin et al. (2018) suggested that at 70 m the environmental conditions remained seasonally unchanged during the OUTPACE cruise, forming an average wintertime depth of the mixed layer. These authors calculated seasonal (from winter to austral summer) net DOM and POM accumulation on the basis of such assumptions and found a dominance of DOC accumulation in the MA area (391 to 445 mmol m−2 over 8 months). This DOC accumulation in the MA area was 3.8 to 8.1 times higher than that of POC accumulation during the same time period. On the other hand, only DOC accumulated at WGY, although the amount was 2 times lower in magnitude than in the MA (391–445 vs. 220 mmol m−2). The accumulation of DOC and DOCEX (Fig. 6) in the WGY may have important implications with regard to the sequestration of this organic material in the mesopelagic layers. DOC appears to be the major form of carbon export in the WGY area and this result agrees with the general feature observed in oligotrophic regimes (Roshan and DeVries, 2017). Previous investigations have employed the DCNS yields along with mol % of glucose to assess the diagenetic “freshness” of organic matter (Skoog and Benner, 1997; Benner, 2002; Goldberg et al., 2010). In general freshly produced DOM has DCNS yields > 10 % and mol % glucose between 28 % and 71 % (Biersmith and Benner, 1998; Hama and Yanagi, 2001). Elevated mol % glucose (>25 %) does not necessarily mirror fresh material because such values have also been reported for deep DOM and low-molecular-weight DOM that are considered as diagenetically altered material (Skoog and Benner, 1997). 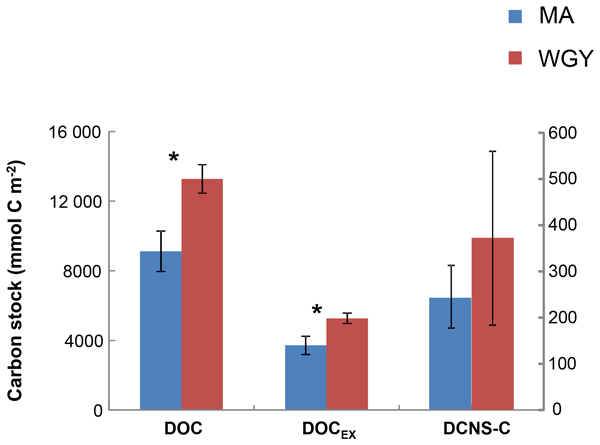 Our results showed that epipelagic DCNS yields were similar (∼2.8 %) in both the WGY and MA areas (Table 1), further indicating a similar contribution of DCNS to the DOC pool despite the major differences observed for the other biogeochemical parameters (e.g., deepening of the nitraclines, deep chlorophyll maximum, etc.) between MA and WGY. As expected, DCNS yields decreased by depth but were always comparable between the WGY and MA areas (Table 1). By analogy to DOCSL, we tried to estimate a DNCS residence time assuming that (i) ectoenzymatic hydrolysis is a rate-limiting step for bacterial production, (ii) the mean contribution of polysaccharide hydrolysis to bacterial production is 11 %, based on Piontek et al. (2011), and (iii) this 11 % correction factor can be propagated to BCD. On the basis of these assumptions, we estimated a DCNS residence time as DCNS ∕ (11 % × BCD). The results showed that DCNS exhibited a higher residence time in the WGY (TrDCNS-C=91±41 days, n=3) than the MA area (TrDCNS-C=31±10 days, n=8), which clearly shows that the DCNS pool persists longer in the surface waters of the WGY (Fig. 7). Moreover, because carbohydrates do not absorb light, these polysaccharides (DCNS) do not seem to be impacted by the high photochemistry in WGY and potentially may be exported in the ocean interior during a non-stratification period (e.g., wintertime) considering their high residence time at the WGY area. In addition, their slow utilization could also be related to energy limitation by heterotrophic prokaryotes in the WGY area. Glucose accounted for ∼50 % of DCNS in the MA surface waters, which most likely reflects the high abundance of Trichodesmium species in that area (Dupouy et al., 2018; Rousset et al., 2018). A roughly similar percentage of glucose was also recorded in surface WGY waters (Fig. 5a), which is probably due to the low utilization of semi-labile organic matter in the form of exopolysaccharides. One hypothesis could be that these polysaccharides are slowly hydrolyzed by bacterial ectoenzymes, which are probably scarce due to limited energy or nutrient availability. At 200 m of depth, glucose accounted for 75 % and 50 % of DCNS in the WGY and MA areas, respectively (200 m of depth), and this percentage increased considerably with depth in both areas (76 % for MA and 96 % for WGY at 2000 m of depth), indicating preferential removal of the other carbohydrates relative to glucose (Fig. 5b and c). The low DCNS yields (∼1 %) at 2000 m of depth along with the high % mol abundance of glucose clearly suggest the presence of diagenetically altered DOM and are consistent with previous investigations (Skoog and Benner, 1997; Goldberg et al., 2010, 2011). This study showed a rather uniform distribution of DOC and DCNS concentrations in surface waters across an increasing oligotrophic gradient in the southwest Pacific Ocean during the OUTPACE cruise. Nevertheless, our results showed that DOC and DOCEX stocks were ∼40 % higher in the WGY than the MA area, accompanied by higher residence times in the WGY area, suggesting an accumulation of semi-labile material in the euphotic zone of WGY. 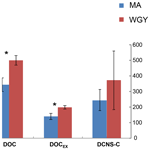 Although DCNS accounted for a small fraction of DOCSL (∼7 %) our results showed that DCNS or polysaccharides also exhibited a higher residence time (Tr DCNS-C) in the WGY than in the MA area, indicating that DCNS persists longer in the WGY. This Tr DCNS-C is calculated on the basis of many assumptions on DNCS hydrolysis rates that were not practically determined, showing the need to estimate such fluxes in order to better estimate the dynamics of carbohydrates. Glucose was the major monosaccharide in both areas (51 %–55 %) and its relative abundance increased with depth along with a decrease in DCNS yields, indicating preferential removal of other carbohydrates relative to glucose. All data are available upon request through the OUTPACE cruise database (http://www.obs-vlfr.fr/proof/php/outpace/outpace.php, last access: 30 August 2018) (OUTPACE, 2018). CP performed the sugar analysis. MP-P performed the DOC analysis and MB the sampling. FVW performed the bacterial analyses and the statistical analysis of the data. RS supervised the initial stages of this research. All authors discussed the results and contributed to the final paper. 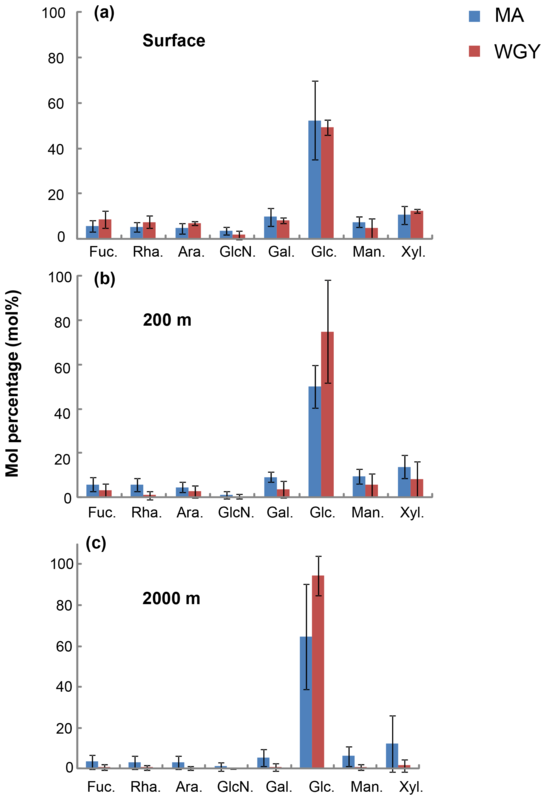 This article is part of the special issue “Interactions between planktonic organisms and biogeochemical cycles across trophic and N2 fixation gradients in the western tropical South Pacific Ocean: a multidisciplinary approach (OUTPACE experiment)”. It is not associated with a conference. This is a contribution of the OUTPACE (Oligotrophy from Ultra-oligoTrophy PACific Experiment) project led by Thierry Moutin and Sophie Bonnet and funded by the French national research agency (ANR-14-CE01-0007-01), the LEFE-CyBER program (CNRS-INSU), the GOPS program (IRD) and CNES (BC T23, ZBC 4500048836). The OUTPACE cruise (http://dx.doi.org/10.17600/15000900) was managed by the MIO from Marseille (France). The authors thank the crew of the R/V L'Atalante for outstanding shipboard operation. Gilles Rougier and Marc Picheral are thanked for their efficient help in CTD rosette management and data processing. Catherine Schmechtig is acknowledged for LEFE CYBER database management. We also thank Aurelia Lozingot for administrative aid for the OUTPACE project. The authors also acknowledge Ronald Benner and one anonymous reviewer for valuable comments and fruitful discussions. Mar Benavides was funded by the People Programme (Marie Skłodowska-Curie Actions) of the European Union's Seventh Framework Programme (FP7/2007-2013) under REA grant agreement number 625185. Christos Panagiotopoulos received support from the PACA region (MANDARINE project, grant number 2008-10372) and Aix Marseille University (ORANGE project, FI-2011). Aluwihare, L. I. and Repeta, D. J.: A comparison of the chemical characteristics of oceanic DOM and extracellular DOM produced by marine algae, Mar. Ecol. Progr. Ser. 186, 105–117, 1999. Aluwihare, L. I., Repeta, D. J., and Chen, R. F.: A major biopolymeric component to dissolved organic carbon in seawater, Nature, 387, 166–167, 1997. Benavides, M., Shoemaker, K. M., Moisander, P. H., Niggemann, J., Dittmar, T., Duhamel, S., Grosso, O., Pujo-Pay, M., Hélias-Nunige, S., and Bonnet, S.: Aphotic N2 fixation along an oligotrophic to ultraoligotrophic transect in the Western Tropical South Pacific Ocean, Biogeosciences, 15, 3107–3119, https://doi.org/10.5194/bg-15-3107-2018, 2018. Bender, M. L. and Jonsson, B.: Is seasonal net community production in the south Pacific subtropical gyre anomalously low?, Geophys. Res. Lett., 43, 9757–9763, https://doi.org/10.1002/2016GL070220, 2016. Benner, R.: Chemical composition and reactivity, in: Biogeochemistry of Marine Dissolved Organic Matter, edited by: Hansell, D. and Carlson, C., Academic Press, New York, USA, 59–90, 2002. Benner, R. and Kaiser, K.: Abundance of amino sugars and peptidoglycan in marine particulate and dissolved organic matter, Limnol. Oceanogr., 48, 118–128, 2003. Biersmith, A. and Benner, R.: Carbohydrates in phytoplankton and freshly produced dissolved organic matter, Mar. Chem., 63, 131–144, 1998. Bonnet, S., Dekaezemacker, J., Turk-Kubo, K. A., Moutin, T., Hamersley, R. M., Grosso, O., Zehr, J. P. and Capone, D. G.: Aphotic N2 Fixation in the Eastern Tropical South Pacific Ocean, PLOS ONE, 8, e81265, https://doi.org/10.1371/journal.pone.0081265, 2013. Bonnet, S., Caffin, M., Berthelot, H., and Moutin, T.: Hot spot of N2 fixation in the western tropical South Pacific pleads fora spatial decoupling between N2 fixation and denitrification, P. Natl. Acad. Sci. USA, 114, E2800–E2801, https://doi.org/10.1073/pnas.1619514114, 2017. Browning, T. J., Achterberg, E. P., Rapp, I., Engel, A., Bertrand, E. M., Tagliabue, A., and Moore, M.: Nutrient co-limitation at the boundary of an oceanic gyre, Nature, 551, 242–246, 2017. Caffin, M., Moutin, T., Foster, R. A., Bouruet-Aubertot, P., Doglioli, A. M., Berthelot, H., Guieu, C., Grosso, O., Helias-Nunige, S., Leblond, N., Gimenez, A., Petrenko, A. A., de Verneil, A., and Bonnet, S.: N2 fixation as a dominant new N source in the western tropical South Pacific Ocean (OUTPACE cruise), Biogeosciences, 15, 2565–2585, https://doi.org/10.5194/bg-15-2565-2018, 2018. Carlson, C. A. and Hansell, D. A.: DOM sources, sinks, reactivity, and budgets, in: Biogeochemistry of marine dissolved organic matter, edited by: Hansell, D. A. and Carlson, C. A., Elsevier, Academic Press, San Diego, 66–109, 2015. Cauwet, G.: Determination of dissolved organic carbon (DOC) and nitrogen (DON) by high temperature combustion, in: Methods of seawater analysis, 3rd Edn., edited by: Grashoff, K., Kremling, K., and Ehrhard, M., WILEY-VCH Verlag GmbH, Weinheim, 407–420, 1999. Claustre, H., Sciandra, A., and Vaulot, D.: Introduction to the special section bio-optical and biogeochemical conditions in the South East Pacific in late 2004: the BIOSOPE program, Biogeosciences, 5, 679–691, https://doi.org/10.5194/bg-5-679-2008, 2008. Cozar, A., Echevarria, F., Gonzalez-Gordillo, J. I., Irigoien, X., Ubeda, B., Hernadez-Leon, S., Palma, A. T., Navarro, S., Garcia-de-Lomas, J., Ruiz, A., Fernadez-de-Puelles, M. L., and Duarte, C. M.: Plastic debris in the open ocean, P. Natl. Acad. Sci. USA, 111, 10239–10244, 2014.
de Verneil, A., Rousselet, L., Doglioli, A. M., Petrenko, A. A., and Moutin, T.: The fate of a southwest Pacific Bloom: Gauging the impact of submesoscale vs. mesoscale circulation on biological gradients in the subtropics, Biogeosciences, 14, 3471–3486, https://doi.org/10.5194/bg-14-3471-2017, 2017.
de Verneil, A., Rousselet, L., Doglioli, A. M., Petrenko, A. A., Maes, C., Bouruet-Aubertot, P., and Moutin, T.: OUTPACE long duration stations: physical variability, context of biogeochemical sampling, and evaluation of sampling strategy, Biogeosciences, 15, 2125–2147, https://doi.org/10.5194/bg-15-2125-2018, 2018. D'Hondt, S., Spivack, A. J., Pockalny, R., Ferderlman, T. G., Fischer, J. P., Kallmeyer, J., Abrams, L. J., Smith, D. C., Graham, D., Hasiuk, F., Schrum, H., and Stancin, A. M.: Subseafloor sedimentary life in the South Pacific Gyre, P. Natl. Acad. Sci. USA, 106, 11651–11656, 2009. Di Lorenzo, E., Schneider, N., Cobb, K. M., Franks, P. J. S., Chhak, K., Miller, A. J., Mc Williams, J. C., Bograd, S. J., Arango, H., Curchitser, E., Powell, T. M., and Riviere, P.: North Pacific Gyre Oscillation links ocean climate and ecosystem change, Geophys. Res. Lett., 35, L08607, https://doi.org/10.1029/2007gl032838, 2008. Doval, M. D. and Hansell, D. A.: Organic carbon apparent oxygen utilization in the western South Pacific and the central Indian Oceans, Mar. Chem., 68, 249–264, 2000. Duhamel, S., Van Wambeke, F., Lefevre, D., Benavides, M., and Bonnet, S.: Mixotrophic metabolism by natural communities of unicellular cyanobacteria in the western tropical South Pacific Ocean, Environ. Microbiol., 20, 2473–2756, https://doi.org/10.1111/1462-2920.14111, 2018. Dupouy, C., Frouin, R., Tedetti, M., Maillard, M., Rodier, M., Lombard, F., Guidi, L., Picheral, M., Duhamel, S., Charrière, B., and Sempéré, R.: diazotrophic Trichodesmium influences ocean color and pigment composition in the South West tropical Pacific, Biogeosciences, 15, 5249–5269, https://doi.org/10.5194/bg-15-5249-2018, 2018. Engel, A. and Handel, N.: A novel protocol for determining the concentration and composition of sugars in particulate and in high molecular weight dissolved organic matter (HMW-DOM) in seawater, Mar. Chem., 127, 180–191, 2011. Engel, A., Harlay, J., Piontek, J., and Chou, L.: Contribution of combined carbohydrates to dissolved and particulate organic carbon after the spring bloom in the northern Bay of Biscay (North-Eastern Atlantic Ocean), Cont. Shelf Res., 45, 42–53, 2012. Eriksen, M., Maximenko, N., Thiel, M., Cummins, A., Lattin, G., Wilson, S., Hafner, J., Zellers, A., and Rifman, S.: Plastic pollution in the South Pacific subtropical gyre, Mar. Pollut. Bull., 68, 71–76, 2013. Goldberg, S. J., Carlson, C. A., Bock, B., Nelson, N. B., and Siegel, D. A.: Meridional variability in dissolved organic matter stocks and diagenetic state within the euphotic and mesopelagic zone of the North Atlantic subtropical gyre, Mar. Chem., 119, 9–21, 2010. 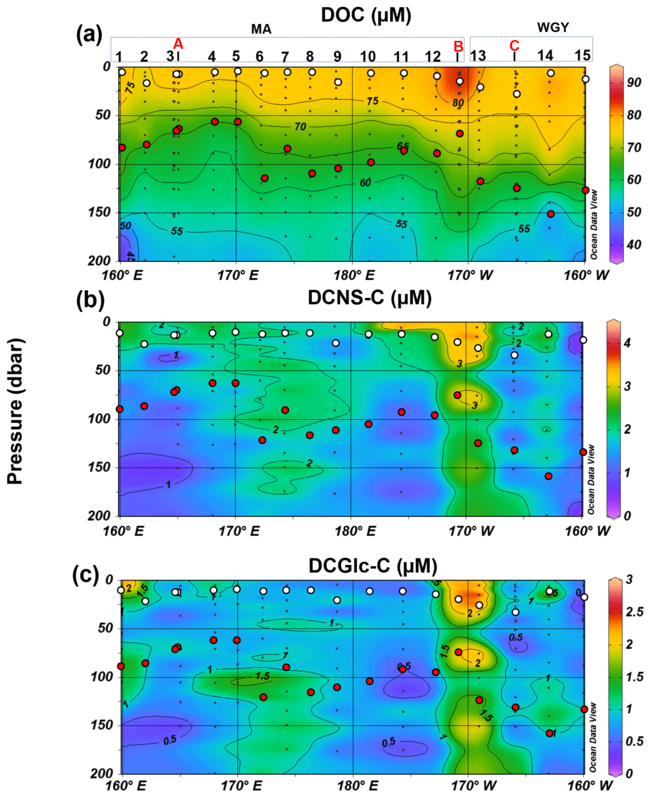 Goldberg, S. J., Carlson, C. A., Brzezinski, M., Nelson, N. B., and Siegel, D. A.: Systematic removal of neutral sugars within dissolved organic matter across ocean basins, Geophys. Res. Lett., 38, L17606, https://doi.org/10.1029/2011GL048620, 2011. Guyennon, A., Baklouti, M., Diaz, F., Palmieri, J., Beuvier, J., Lebaupin-Brossier, C., Arsouze, T., Béranger, K., Dutay, J.-C., and Moutin, T.: New insights into the organic carbon export in the Mediterranean Sea from 3-D modeling, Biogeosciences, 12, 7025–7046, https://doi.org/10.5194/bg-12-7025-2015, 2015. Hama, T. and Yanagi, K.: Production and neutral aldose composition of dissolved carbohydrates excreted by natural marine phytoplankton populations, Limnol. Oceanogr., 46, 1945–1955, 2001. Hansell, D. A., Carlson, C. A., Repeta, D. J., and Schlitzer, R.: Dissolved organic matter in the Ocean: A controversy stimulates new insights, Oceanography, 22, 202–211, 2009. Hung, C.-C., Guo, L., Santschi, P. H., Alvarado-Quiroz, N., and Haye, J. M.: Distributions of carbohydrate species in the Gulf of Mexico, Mar. Chem., 81, 119–135, 2003. Jiao, N., Herndl, G. J., Hansell, D. A., Benner, R., Kattner, G. K., Wilhelm, S. W., Kirchman, D. L., Weinbauer, M. G., Luo, T., Chen, F., and Azam, F.: Microbial production of recalcitrant dissolved organic matter: long-term carbon storage in the global ocean, Nat. Rev. Microbiol., 8, 593–599, 2010. Kaiser, K. and Benner, R.: Biochemical composition and size distribution of organic matter at the Pacific and Atlantic time-series stations, Mar. Chem., 113, 63–77, 2009. Kaiser, K. and Benner, R.: Organic matter transformations in the upper mesopelagic zone of the North Pacific: Chemical composition and linkages to the microbial community structure, J. Geophys. Res., 117, C01023, https://doi.org/10.1029/2011JC007141, 2012. Kirchman, D. L.: Leucine incorporation as a measure of biomassproduction by heterotrophic bacteria, in: Handbook of methodsin aquatic microbial ecology, edited by: Kemp, P. F., Sherr, B. F., Sherr, E. B., and Cole, J. J., Lewis, Boca Raton, 509–512, 1993. Kirchman, D. L., Meon, B., Ducklow, H. W., Carlson, C. A., Hansell, D. A., and Steward, G.: Glucose fluxes and concentrations of dissolved combined sugars (polysaccharides) in the Ross Sea and Polar Front Zone, Antarctica, Deep-Sea Res. Pt. II, 48, 4179–4197, 2001. Law, K. L., Morét-Ferguson, S., Maximenko, N. A., Proskurowski, G., Peacock, E. E., Hafner, J., and Reddy, C. M.: Plastic accumulation in the North Atlantic subtropical gyre, Science, 329, 1185–1188, 2010. Letscher, R. T. and Moore, J. K.: Preferential remineralization of dissolved organic phosphorus and non-Redfi eld DOM dynamics in the global ocean: Impacts on marine productivity, nitrogen fixation, and carbon export, Global Biogeochem. Cy., 29, 325–340, https://doi.org/10.1002/2014GB004904, 2015. McCarthy, M., Hedges, J. I., and Benner, R.: Major biochemical composition of dissolved high molecular weight organic matter in seawater, Mar. Chem., 55, 281–297, 1996. Mopper, K., Schultz, C., Chevolot, L., Germain, C., Revuelta, R., and Dawson, R.: Determination of sugars in unconcentrated sea-water and other natural waters by liquid chromatography, Environ. Sci. Technol., 26, 133–137, 1992. Moutin, T., Karl, D. M., Duhamel, S., Rimmelin, P., Raimbault, P., Van Mooy, B. A. S., and Claustre, H.: Phosphate availability and the ultimate control of new nitrogen input by nitrogen fixation in the tropical Pacific Ocean, Biogeosciences, 5, 95–109, https://doi.org/10.5194/bg-5-95-2008, 2008. Moutin, T., Doglioli, A. M., de Verneil, A., and Bonnet, S.: Preface: The Oligotrophy to the UlTra-oligotrophy PACific Experiment (OUTPACE cruise, 18 February to 3 April 2015), Biogeosciences, 14, 3207–3220, https://doi.org/10.5194/bg-14-3207-2017, 2017. Moutin, T., Wagener, T., Caffin, M., Fumenia, A., Gimenez, A., Baklouti, M., Bouruet-Aubertot, P., Pujo-Pay, M., Leblanc, K., Lefevre, M., Helias Nunige, S., Leblond, N., Grosso, O., and de Verneil, A.: Nutrient availability and the ultimate control of the biological carbon pump in the Western Tropical South Pacific Ocean, Biogeosciences, 15, 2961–2989, https://doi.org/10.5194/bg-15-2961-2018, 2018. Murrell, M. C. and Hollibaugh, J. T.: Distribution and composition of dissolved and particulate organic matter in northern San Francisco bay during low flow conditions, Estuar. Coast. Shelf Sci., 51, 75–90, 2000. OUTPACE: OUTPACE cruise database, available at: http://www.obs-vlfr.fr/proof/php/outpace/outpace.php, last access: 30 August 2018. Panagiotopoulos, C. and Sempéré, R.: Analytical methods for the determination of sugars in marine samples: A historical perspective and future directions, Limnol. Oceanogr. Meth., 3, 419–454, 2005. Panagiotopoulos, C., Sempéré, R., Lafont, R., and Kerhervé, P.: Sub-ambient temperature effects on separation of monosaccharides by HPAEC-PAD. Application to marine chemistry, J. Chromatogr. A., 920, 13–22, 2001. Panagiotopoulos, C., Repeta, D. J., Mathieu, L., Rontani, J.-F., and Sempéré, R.: Molecular level characterization of methyl sugars in marine high molecular weight dissolved organic matter, Mar. Chem., 154, 34–45, 2013. Panagiotopoulos, C., Sempéré, R., Jacq, V., and Charrière, B.: Composition and distribution of dissolved carbohydrates in the Beaufort Sea Mackenzie margin (Arctic Ocean), Mar. Chem., 166, 92–102, 2014. Piontek, J., Händel, N., de Bodt, C., Harlay, J., Chou, L., and Engel, A.: The utilization of polysaccharides by heterotrophic bacterioplankton in the Bay of Biscay (North Atlantic Ocean), J. Plankton Res., 33, 1719–1735, 2011. Raimbault, P., Garcia, N., and Cerutti, F.: Distribution of inorganic and organic nutrients in the South Pacific Ocean – evidence for long-term accumulation of organic matter in nitrogen-depleted waters, Biogeosciences, 5, 281–298, https://doi.org/10.5194/bg-5-281-2008, 2008. Rich, J. H., Ducklow, H. W., and Kirchman, D. L.: Concentrations and uptake of neutral monosaccharides along 140∘ W in the equatorial Pacific: contribution of glucose to heterothrophic bacterial activity and the DOMflux, Limnol. Oceanogr., 41, 595–604, 1996. Roshan, S. and DeVries, T.: Efficient dissolved organic carbon production and export in the oligotrophic Ocean, Nature, 8, 2036, https://doi.org/10.1038/s41467-017-02227-3, 2017. Rousset, G., De Boissieu, F., Menkes, C. E., Lefèvre, J., Frouin, R., Rodier, M., Ridoux, V., Laran, S., Bonnet, S., and Dupouy, C.: Remote sensing of Trichodesmium spp. mats in the western tropical South Pacific, Biogeosciences, 15, 5203–5219, https://doi.org/10.5194/bg-15-5203-2018, 2018. Sempéré, R., Tedetti, M., Panagiotopoulos, C., Charriẽre, B., and Van Wambeke, F.: Distribution and bacterial availability of dissolved neutral sugars in the South East Pacific, Biogeosciences, 5, 1165–1173, https://doi.org/10.5194/bg-5-1165-2008, 2008. Shen, Y., Fichot, C. G., Liang, S.-K., and Benner, R.: Biological hot spots and the accumulation of marine dissolved organic matter in a highly productive ocean margin, Limnol. Oceanogr., 61, 1287–1300, 2016. Sibert, E., Norris, R., Cuevas, J., and Graves, L.: Eighty-five million years of Pacific Ocean gyre ecosystem structure: long-term stability marked by punctuated change, Proc. Roy. Soc. B, 283, 20160189, https://doi.org/10.1098/rspb.2016.0189, 2016. Skoog, A. and Benner, R.: Aldoses in various size fractions of marine organic matter: Implications for carbon cycling, Limnol. Oceanogr., 42, 1803–1813, 1997. Skoog, A., Biddanda, B., and Benner, R.: Bacterial utilization of dissolved glucose in the upper water column of the Gulf of Mexico, Limnol. Oceanogr., 44, 1625–1633, 1999. Smith, D. C. and Azam, F.: A simple, economical method for measuring bacterial protein synthesis rates in sea water using 3H-Leucine, Mar. Microb. Food Webs, 6, 107–114, 1992. Stenegren, M., Caputo, A., Berg, C., Bonnet, S., and Foster, R. A.: Distribution and drivers of symbiotic and free-living diazotrophic cyanobacteria in the Western Tropical South Pacific, Biogeosciences, 15, 1559–1578, https://doi.org/10.5194/bg-15-1559-2018, 2018. Tedetti, M., Sempéré, R., Vasilkov, A., Charrière, B., Nérini, D., Miller, W. L., Kawamura, K., and Raimbault, P.: High penetration of ultraviolet radiation in the south east Pacific waters, Geophys. Res. Lett., 34, L12610, https://doi.org/10.1029/2007GL029823, 2007. Thingstad, T. F., Hagstrom, A., and Rassoulzadegan, F.: Accumulation of degradable DOC in surface waters: Is it caused by a malfunctioning microbial loop?, Limnol. Oceanogr., 42, 398–404, 1997. Van Pinxteren, M., Muller, C., Iinuma, Y., Stolle, C., and Hermann, H.: Chemical characterization of dissolved organic compounds from coastal sea surface microlayers (Baltic Sea, Germany), Environ. Sci. Technol., 46, 10455–10462, 2012. 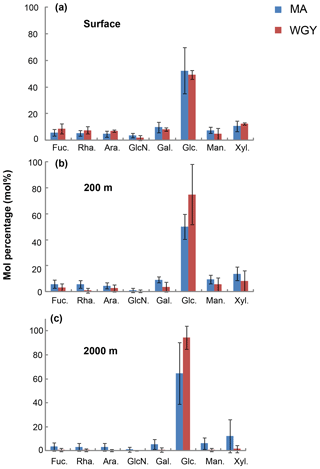 Van Wambeke, F., Bonnet, S., Moutin, T., Raimbault, P., Alarcón, G., and Guieu, C.: Factors limiting heterotrophic bacterial production in the southern Pacific Ocean, Biogeosciences, 5, 833–845, https://doi.org/10.5194/bg-5-833-2008, 2008. Van Wambeke, F., Gimenez, A., Duhamel, S., Dupouy, C., Lefevre, D., Pujo-Pay, M., and Moutin, T.: Dynamics and controls of heterotrophic prokaryotic production in the western tropical South Pacific Ocean: links with diazotrophic and photosynthetic activity, Biogeosciences, 15, 2669–2689, https://doi.org/10.5194/bg-15-2669-2018, 2018. Wright, R. R. and Hobbie, J. E.: Use of glucose and acetate by bacteria and algae in aquatic ecosystems, Ecology, 47, 447–464, 1966. Zang, X., Church, J. A., Platten, S. M., and Monselesan, D.: Projection of subtropical gyre circulation and associated sea level changes in the Pacific based on CMIP3 climate models, Clim. Dynam., 43, 131–144, 2014.